Anne-François-Louis Janmot (May 21, 1814–June 1, 1892) was a French painter and poet. 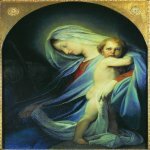 In his paintings the immaculate finish of Ingres was combined with a mysticism that has parallels in the work of his contemporaries the Nazarenes and the Pre-Raphaelites. His most significant work, a cycle of 18 paintings and 16 drawings, with verse, called La Poème de l\\\'âme, occupied him for 40 years. Janmot has been seen as a transitional figure between Romanticism and Symbolism.